Deep Dark Chocolate Cake recipe by Robina Shams at DesiRecipes.com. Cadbury drinking powder: 2 tbsp. Ghee or butter: 6 tsp. Mix flour and baking powder in a bowl, in another bowl beat oil and powdered sugar for sometime. Beat egg white and yolk separately and mix both of these in oil and sugar mixture. 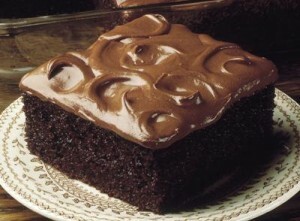 Now add cocoa powder and milk( in very small quantity) and powdered milk and then beat slowly until forms a soft paste. Finally we add the mixture in flour slowly while beating it, until it unites into one another and then we pour this batter into the cake mold, before pouring the mixture into mold make sure u first grease it with oil generously. Put the mold in the preheated (15 minutes before)oven between 180250C, for about one hour, keep checking after half hour if the cake is ready with a knife. One important tip is that never switch the flame again and again while baking, set the temperature once and let it remain till the end. After the cake is baked, take it out from oven and after it gets cold remove from the mold and wait for another 20 minutes so that the cake is cold enough for icing. Put in a bowl ghee or butter or u can take half amount of ghee and half amount of butter and add to it sugar, cocoa powder, milo, cadbury chocolate powder and mix it well, (do not cook).now pour this icing sauce on the cake all over, make sure it is thick enough to stick the cake, if it is very thick then before mixing all the ingredients heat the ghee a little bit and then add all.